A PERFECT CIRCLE, HIGHLY SUSPECT, THE BRONX and GRETA VAN FLEET are among the rock artists scheduled to appear at this year’s edition of the Coachella Valley Music And Arts Festival. 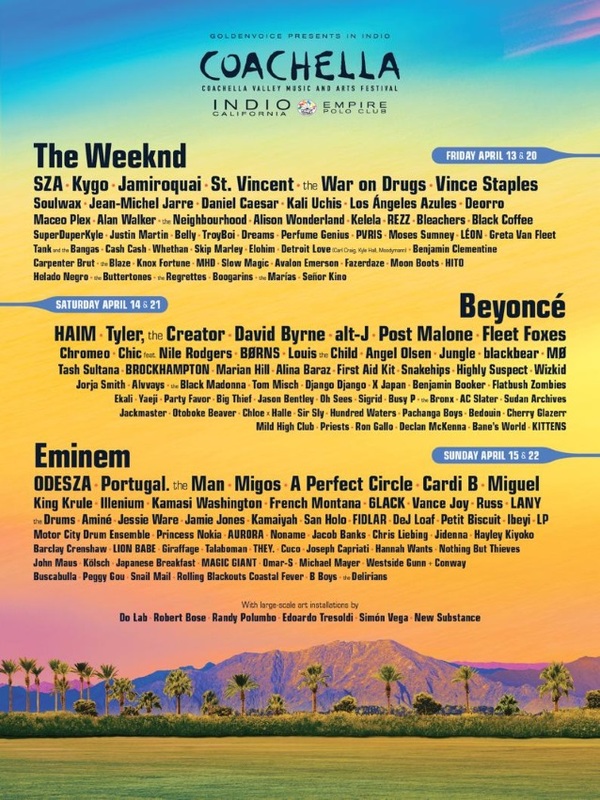 The two-weekend event, which will be held on April 13-15 and April 20-22 at the Empire Polo Field in Indio, California, will be headlined by Beyoncé, The Weeknd and Eminem. General admission passes are $429, including fees and taxes, while the Festival Pass and Shuttle Combo is $504. VIP Festival Passes are $999 and VIP parking is $150. Passes go on sale at noon Friday, January 5 at Coachella.com. Coachella was recently named the Billboard Top Festival Of The Year. It grossed a record $114 million in 2017. A PERFECT CIRCLE will release a new studio album later this year. It will be the band’s first since it signed a worldwide recording deal with BMG. Helming the follow-up to “eMOTIVe” is producer Dave Sardy.